Dr Emmet English is Director of Resonate Consultants, a consultancy that provides clear, straight forward and practical solutions to potentially complex noise and vibration problems. 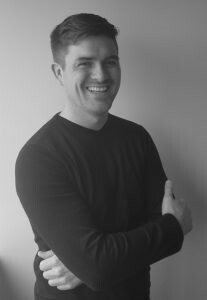 Emmet has worked as a professional acoustic consultant on over 200 projects in Ireland, the United Kingdom, Australasia, the Middle East and the USA. Emmet specialises in acoustics and vibration, with expertise in a variety of areas such as environmental noise, vibration isolation and design, building acoustics design, and transportation noise. Presentation Title: ‘Cost effective noise reduction strategies for EPA Licensed Industry’. Synopsis: Approximately 20% complaints against Industrial and Waste Management Facilities to the EPA Ireland are due to noise. When new industrial facilities are developed or established industrial facilities grow, achieving compliance with the relevant noise limits can be challenging. Developing a picture of a facilities noise footprint allows the site to develop a cost effective noise control strategy that can be implemented in stages to achieve long term compliance. This presentations goes through the fundamentals of developing such a strategy with examples of clever solutions to common challenges.